In eight years, Otaku Journalist has earned more than 1.1 million unique views. That means over a million people have seen this website at one time or another. A lot of them came from Twitter, and no small amount of them came from Buzzfeed. 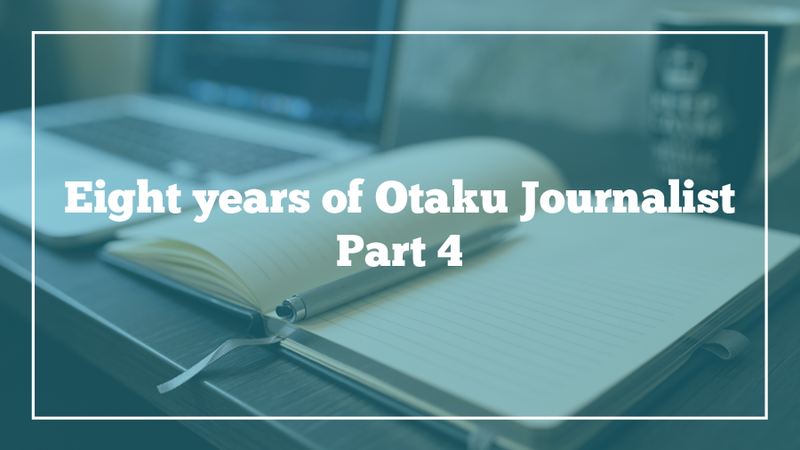 But 450,000 of them—almost half of the entire viewership—discovered Otaku Journalist using a search engine. Most of my most-viewed posts do so not because they are particularly resonant or frequently shared; they just happen to have good SEO. By chance of keywords or unique answers to specific, frequent queries, these show up in search results more than any of my other posts. Even knowing that, this is the only blog I don’t keyword research for. If it works, it works, but with so many other projects going simultaneously, I need one place I can write what I want. So with that in mind, let’s check out the final five of my top 20 most popular posts. I met Victoria for the first time when I visited the old Crunchyroll headquarters in 2013. They’ve since moved to a different San Francisco location but I sure hope they still have a meeting room named Seele. Victoria looked exactly like her selfies and her desk was absolutely piled with anime merch. I admit I immediately arranged to do an email interview after meeting her. Unfortunately, this post has gotten her a lot of flack from people who only read the title. As the interview itself shows, Victoria works incredibly hard, but my title hyped one of the perks of her job a little too strongly and now everyone thinks they could do it (spoiler: they can’t). Gundam Seed Destiny is not a good TV show, but Gundam Destiny Extreme Burst Mode (affiliate link) is the prettiest kit in our collection. I wrote this post a few months before we started Gunpla 101, mainly because I had taken some photos of it I was proud of. This is an example of how Otaku Journalist has narrowed its focus over the years. When I have another topic I want to write about this much, I just start a new blog about it. This is a very early and underdeveloped version of an article I wrote for Anime Feminist: How fan service can attract or repel an audience, and how to tell the difference. That article, about Keijo!!!!!!! !, discussed how fanservice isn’t always repulsive to me as a feminist—in fact, sometimes it fits perfectly into a show’s storytelling technique. This article is more like an apology for enjoying an anime with problematic elements without really getting into what makes it work. I basically just apologized for My Little Monster while shrugging my shoulders, saying, “if I vowed to stop watching any show with sexist elements, I’d have to quit watching American TV.” Today I disagree—there are more delicate ways to critique a TV show than simply accepting or rejecting it as an all-or-nothing lump sum. Unlike the fifth most popular post, I actually wrote this one before I visited headquarters and met CEO Kun Gao in person. I had seen a blog post making the rounds that asserted that legal anime streaming, especially through Crunchyroll, actually hurt anime creators. The post was getting a lot of traction but didn’t cite any sources, so I was suspicious. If you read my interview, you’ll see the same thing Miles is always talking about—Crunchyroll does pay anime creators. The post that launched a brand new blog. It took me a while to put two and two together and realize the affiliate links in this post were netting serious numbers and that just maybe, making good money from blogging wasn’t just a pipe dream. It took me three years from this post to actually launch Gunpla 101 in 2014, but it changed my perspective on blogging forever. I learned a whole new suite of skills—from optimizing my writing for search engines, to managing an affiliate account, to managing and editing a team of writers. Even though it’s about plastic toy robots, it’s usually the most impressive point on my resume to clients that hire me for copywriting, web design, and SEO. Thanks for indulging me for an entire month! It’s been neat to go down memory lane, and great for my NaNoWriMo focus not to come up with new post ideas each week. Now, my NaNoWriMo project is in the home stretch of its 50,000-word goal. One more time, here’s my word count as of the night before this post went up: 43,770. I can’t believe how close I am! 1.1 million views? Well, I guess you can now call yourself a “millionaire” [blogger], right? (I’m just hoping to hit half-a-mil by my 10th Anniversary, personally) Anyway, it is interesting that four of your Top 5 posts are either about CrunchyRoll or Gunpla, because it does give a nice indication as to what anime fans are most interested in: Where they get their anime from & cool merchandise. Not surprising, really, but still interesting. Awesome you are so close, hope it finishes!